Our lives are driven by stories. Everyone loves being a part of a great story. As nonprofits we find ourselves in the midst of one great story after another. It is challenging to get these stories out to our community of volunteers and supporters. To catalog and share these stories would be a big deal. 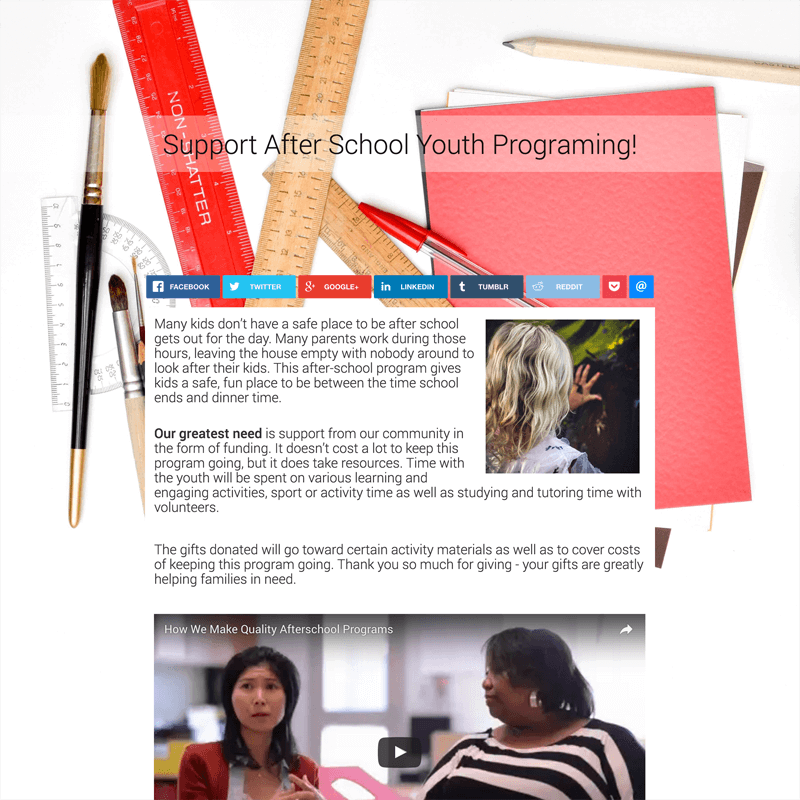 To be able to attach each story to an streamlined donation page creates a natural way to raise money to continue your work. The new Fresh Vine Giving Pages make it easy to connect your stories to donations. You can take advantage of a major marketing trend – landing pages – but adapted to help your organization do good. A good landing page tells a compelling story, and that leads into a compelling action. In business this might be to buy a product, or sign up for a newsletter. 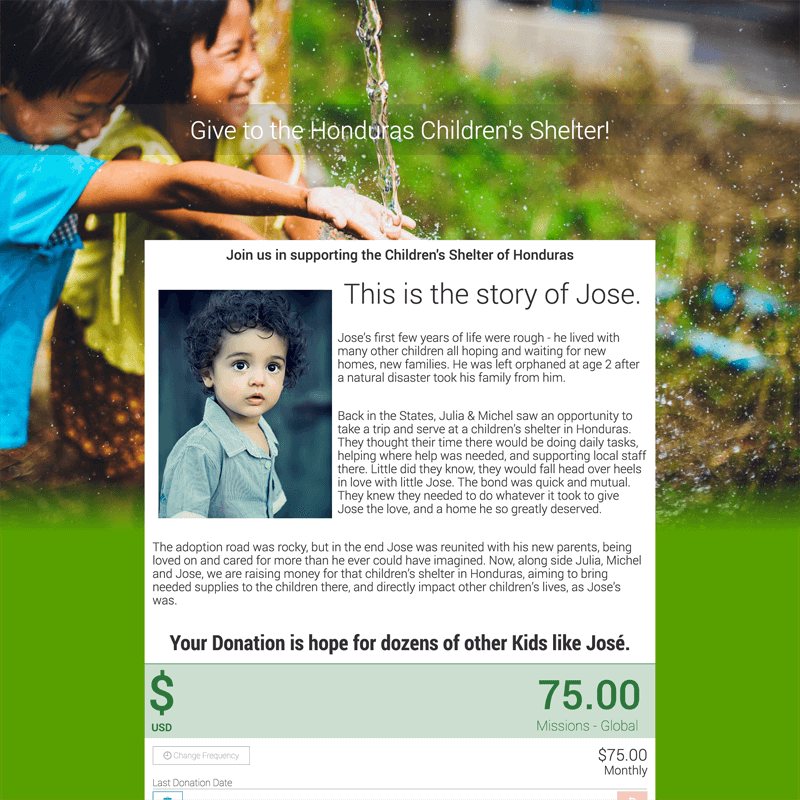 The giving pages let you raise money. The new Giving Pages allow you to tell your stories with an invitation to make a donation. Each page can be built in minutes, it is easy to do, and are sharable all over the web. For the first time you can build and share giving pages in minutes. 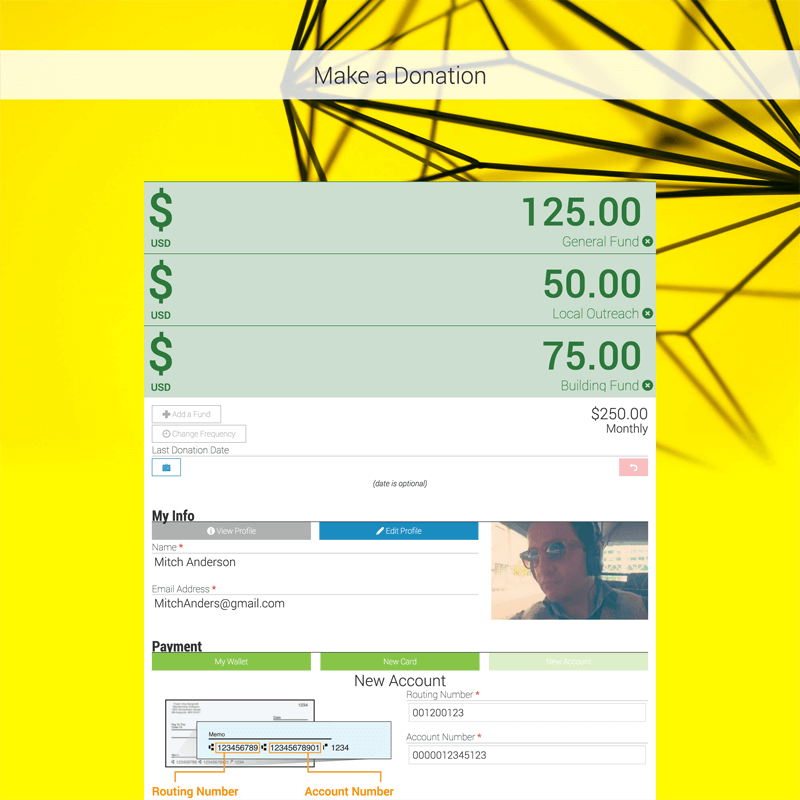 They are easy to design, focused on boosting donations, and make it easy for others to share your stories. Sharing your stories helps to reach out to new donors. Sharing a meaningful story from your programing. Raising funds to respond to a crisis or disaster. Focusing on a capital campaign. Making it easier to support individual staff or projects. Check out the examples below. You can keep reading below to learn more about how these pages work. You can create as many giving pages as you want. This freedom allows you to craft pages for specific purposes. There must always be one default page that lives at the most simple URL for your account. At our demo account it would be https://demo.freshvine.co/give/. You may want every fund available for people to choose from, or just the one. Even more you can choose which funds load on the page by default with the others selectable by choosing to ‘Add a Fund’. There are times for one-time gifts, and times for getting people to commit to a recurring donation. You can specify the default for when the page loads without any presets. As you make changes to the funds, amounts, frequency, and last donation date, the URL for the page dynamically updates. This makes that URL an exact match to the information currently entered on the top half of the form. It has never been easier to follow up with a donor, sending them a page showing their exact commitment to start giving. To see the defaults for the page simply strip off everything in the URL from the ‘?‘ to the right. There are two text areas for you to use. The main one on the Giving Page allows you to invite people to give. The second is on the thank you page that they see after successfully making a gift. Easily add images, or embed media like videos from YouTube, Vimeo, and countless other services. We’ll do our best to make sure it looks good. Each payment method they use in Fresh Vine gets added to their wallet. They can make use of these again in the future to quickly make a donation, or to update an existing recurring gift. Make every page easily identifiable by giving it a unique URL. 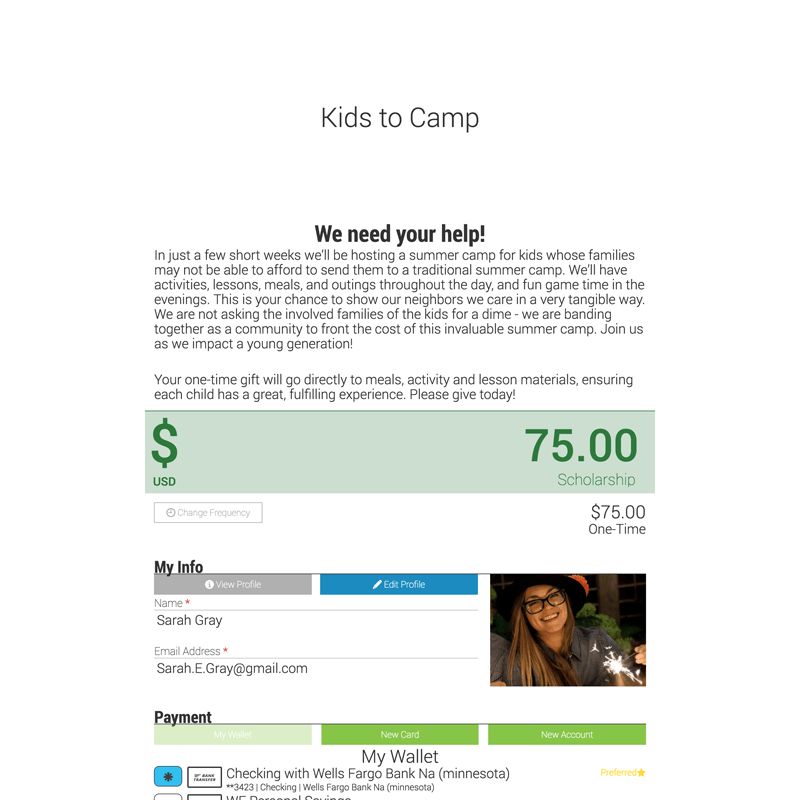 This lets you use a link like – https://demo.freshvine.co/give/sponsor-a-kid-to-camp – to ask for donations to the camp scholarship fund. If you change the URL in the future every old link will redirect people to your new URL automatically. At least until that old URL is reused for another page. Easily choose to place sharing icons on the top, bottom, top & bottom, or nowhere for each page. Let your community easily share the page with all the defaults in tact. You can choose to use a background image, or just a background color. Any image you use will be scaled to the width of the browser window. That background image can stay at the top of the page or scroll with you as you go. There is also the option to enable a simple fade to the background color at the bottom of the image. Easily design a header to go with your background and general layout of the page as a whole. This makes it simple to brand the top of the page exactly as you want to. While every giving page resides inside of our Portal Site you have the ability to hide the navigation when the page loads. This creates a more focused and immersive experience to help people focus on your stories while guiding them to donate.